By Dennis W. Viau; adapted from my grandfather’s recipe. First of all, pronounce it correctly. It’s fah-ZHOH-lee, not fag-ee-OH-lee. This is one of the earliest foods I remember from my childhood. My Italian grandfather used to make this and he would chop a block of hard pork fat down to the consistency of corn meal and toss it in the pot. It’s no wonder he died of a heart attack at the age of 63. I remember his pasta fagioli being delicious, but I don’t add pork fat to my soup. Pasta fagioli (also pasta e fagioli or pasta fazool) is a peasant dish that uses beans when meat is expensive or scarce. I think of it as a comfort food. There is something exquisitely satisfying about a bowl of pasta fagioli on a winter evening. My grandfather and grandmother pronounced it pasta fazool. Note: This soup can be made easily in a pressure cooker. See below. Herbs to taste3, such as oregano, rosemary, thyme, marjoram, etc. Soak the dry beans overnight in about 8 cups of salted water (1 tablespoon salt). Drain and rinse the beans, discarding the water. 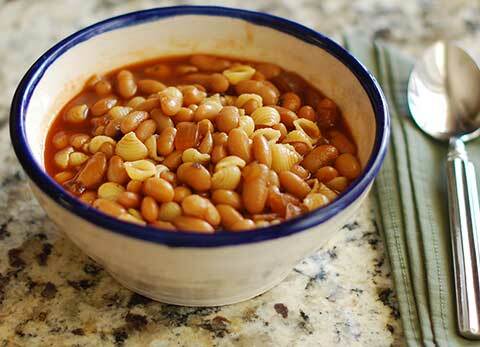 Place beans in a large cooking pot (about 8 quarts or larger) with the stock. Bring to a boil and reduce heat to a simmer. The liquid should be at a very low simmer, barely moving. Cook about 45 minutes. The beans will not yet be tender. Add the tomato paste, onion (optional), garlic, herbs, and pepper. Bring to a boil and simmer over low heat for 20 minutes, uncovered. Check the beans for tenderness. Cook longer if the beans are not yet tender. Taste for salt and adjust as necessary. Cook the pasta according to package directions. Spoon some cooked pasta into bowls and ladle in some bean soup. Serve with grated cheese on the side for garnish. This soup freezes well. If it becomes too thick in storage, water can be added when heating. The recipe for homemade vegetable stock follows. You can use store-bought vegetable broth, but try to find a low-salt, low-sodium variety. Place oil and chopped vegetables in a stock pot heated over medium-low heat to sweat the vegetables for about 10 minutes. (The term sweating means the vegetables start to yield their juices.) Stir occasionally. Carefully add 1½ quarts (1.4 liters) of water and raise the heat to bring to a boil. Reduce heat and simmer for 30 minutes. Remove from the heat and allow to cool enough to handle safely. Use a slotted spoon or “spider web” strainer to remove the solids and place them in a colander or chinois (conical strainer) over a large bowl to drain. Press the solids to extract more liquid. * Discard the solids. Store the stock in the refrigerator until needed. The color might darken considerably in the refrigerator, but when the stock is heated, the color will return to a rich golden hue again. *You can extract more liquid—as much as 2 cups—if you place the solids in a clean piece of cotton muslin and wring to squeeze out more liquid. Can be made a day in advance. Freezes well. The ingredients are the same. I use store-bought vegetable stock for convenience. I put the dry beans in a pressure cooker with enough water to cover well. Attach the lid, bring to full pressure, cook 20 minutes, then let the pressure cooker depressurize naturally. Drain. The beans will be tender, ready to use in your soup.